Uses: The Piper nigrum berries are used for commercial pepper. 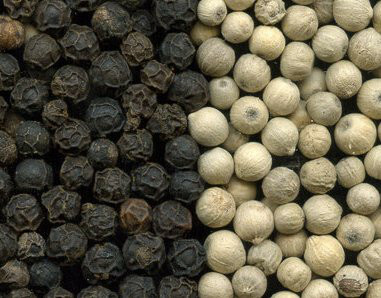 Black peppercorns come from berries that are picked when still green and allowed to dry, white peppercorns are allowed to ripen and are hulled leaving the white kernel. 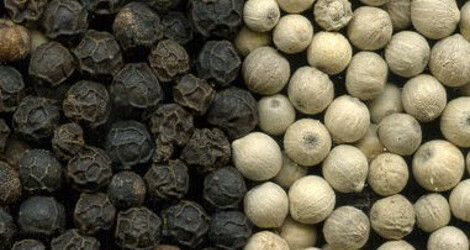 Pepper is more spicy when it is freshly ground due to the volatile oils that are released upon grinding the peppercorns. In Ayurveda, these black peppercorns have been used to aid in digestion, improve appetite, treat coughs, colds, breathing and heart problems. Stomach ailments such as dyspepsia, flatulence, constipation and diarrhea are traditionally treated by mixing black peppercorn with castor oil, cow's urine or ghee. It cleans the digestive system but can cause constipation. While this plant is used as an aphrodisiac, it should also be noted that it is abortion inducing. This plant is known as a Vata and Kapha reducing agent while increasing Pitta. Piper nigrum at ARS-GRIN. Last accessed on Thursday, February 08, 2018. 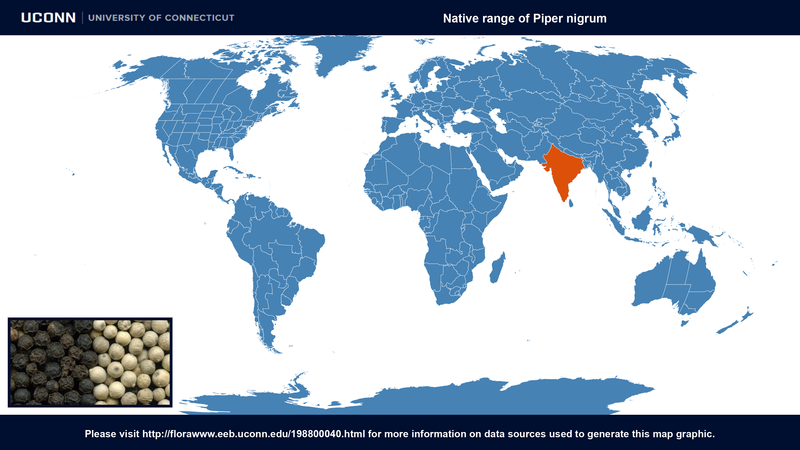 Piper nigrum at Global Biodiversity Information Facility. Last accessed on Thursday, February 08, 2018. Images #00 (modified) & #01 (original) by en:User:Bunchofgrapes (en:Image:Dried Peppercorns.jpg) [GFDL or CC-BY-SA-3.0], via Wikimedia Commons. Last accessed on Thursday, February 08, 2018. Anupama Black Pepper (Kali Mirch) Medicinal Usage, Dosage and Side effects Pub. 2012, Nov. Last accessed on Thursday, February 08, 2018.